The Fed intends to stop reducing its balance sheet this year, which influences the rise in rates, but still remains devoted to raising rates when economic data deems it. The markets interpret this strategy as a mixed signal, whereas the Fed may be unsure as to what direction the economy may actually head. The yield on the 1-year Treasury has been trending higher than the yield on the 5-year Treasury, creating what is know as an inversion, perhaps indicating slower economic growth. As occupations and trades evolved over the decades in the United States, so have the workers that have been on strike. The Bureau of Labor Statistics monitors and tracks the number of idle workers on strike nationwide, known as work stoppages. Over the years, Chinese exports have inundated not only the United States, but the European Union (EU) as well. Similar to the trade imbalances with the U.S., the EU also has trade imbalances with China. 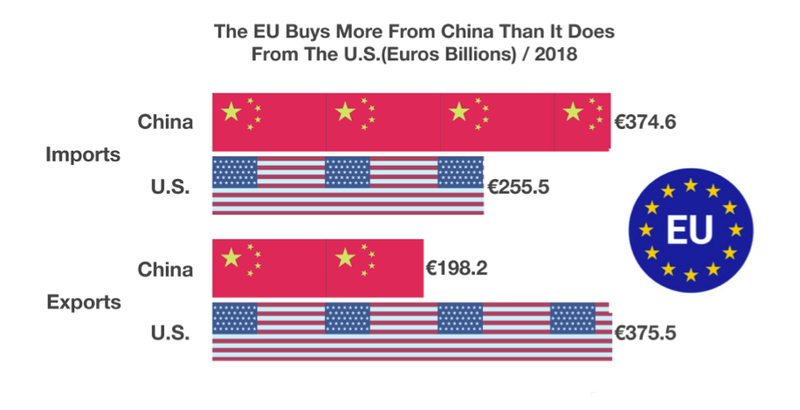 China has become a significant influence on the EU and its trading characteristics, garnering more trade expansion than with the U.S. China is now the EU’s second-largest trading partner behind the United States, while the EU is China’s largest trading partner. The U.S. represents about 17% of the EU’s total trade, while China currently makes up about 15% of the EU’s total trade. The EU, like the U.S., wants to ensure that trade with China is fair, respects intellectual property and meets its obligations as a member of the World Trade Organization (WTO). The majority of the imports into the EU from China include consumer goods, machinery, shoes, and clothing. The bulk of exports from the EU to China are automobiles, planes, and chemicals. This tax season is the first year where all of the changes and provisions passed under the Tax Cuts & Jobs Act are affecting both individual taxpayers and companies with broad changes for deductions and tax rates. The changes, effective January 1, 2019, affect most every tax payer filing as an employee or self- employed business owner. Some of the tax provisions enacted by the new tax act will be temporary, while others permanent. Affecting essentially every taxpayer is the increase in the standard deduction, which is meant to simplify the tax preparation process by replacing itemized deductions with a larger standard deduction. A provision in the tax code known as indexing will affect 2019 Tax Brackets & Rates, which is essentially an inflation adjusted modification to account for rising inflation trends. For 2019, income brackets increased by roughly 2% across all income levels. Income brackets for capital gains have also increased slightly for 2019. With personal exemptions eliminated under the new tax law, a larger single standard deduction was devised in order to streamline returns for taxpayers. Standard deduction amounts increased slightly for 2019. For both employees and self-employed individuals, IRA and Qualified Plan contributions have increased as well for 2019. 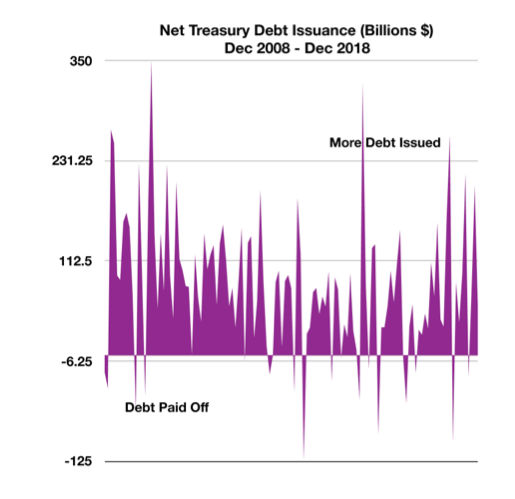 The prospect of an increasing deficit has led to an increase in debt issuance by the Treasury due to an expected shortfall of tax revenue. The Treasury issues debt in order to fund the ongoing operations of the U.S. government. Some of the recent tax measures passed by Congress are expected to reduce revenues while increasing spending, which will in turn be funded by issuing new Treasuries. The debt management process is comprised of both the issuance of new debt and the retirement of preexisting debt. Should the Treasury issue more debt than it is retiring, there is a net increase in the amount of debt outstanding. Data released by the Federal Reserve Bank of New York found that Americans have been borrowing more for automobiles and less for homes. 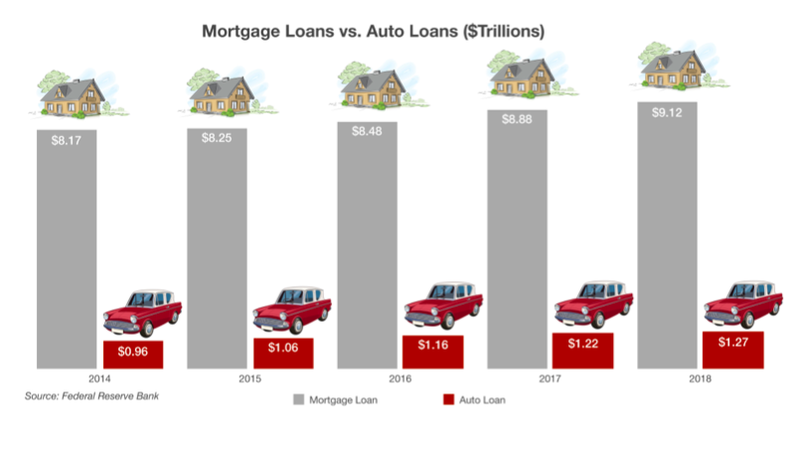 While new mortgages fell to their lowest levels since 2014, car loans have been steadily increasing. A weakening housing sector along with tepid wage growth has affected mortgage demand over the past few quarters. Consumers who have been discouraged by a slowing housing market have instead stayed put and purchased new home goods and cars with their improving credit. Auto loans have been making up a faster growing segment of consumer debt than mortgages. Mortgage loans still make up the single largest debt payment for consumers nationwide, with auto payments the second largest. *Market Returns: All data is indicative of total return which includes capital gain/loss and reinvested dividends for noted period. Index data sources; MSCI, DJ-UBSCI, WTI, IDC, S&P. The information provided is believed to be reliable, but its accuracy or completeness is not warranted. This material is not intended as an offer or solicitation for the purchase or sale of any stock, bond, mutual fund, or any other financial instrument. The views and strategies discussed herein may not be appropriate and/or suitable for all investors. This material is meant solely for informational purposes, and is not intended to suffice as any type of accounting, legal, tax, or estate planning advice. Any and all forecasts mentioned are for illustrative purposes only and should not be interpreted as investment recommendations. Previous Post: « How Much Life Insurance Do You Really Need?